One of the tougher questions for me to answer (next to “where are you from?” but more on that later) is “please define your style.” It’s hard because, as a lover of style and clothes, I hate to narrow myself into a category of fashion perhaps limiting what I explore or am willing to try in the future. Rather than a clothing category, a better description is definitely the idea/attitude/confidence you aim to exude. Can you think of a better answer?! Relaxed glamour, comfortable boundary pushing– I think that is a perfect explanation. What killer looks and SUCH a great answer. That is one great quote, without being too narrowed down and also it’s specific which I like too. I always get asked the same thing over here, ‘where are you from’? It does get tiring so now I just say I’m from Hawaii, sometime Scotland to see what reaction I get! Thanks for my wedding shoe search vibes, back at you girl! I hope I find something for my friend! That is the perfect answer. 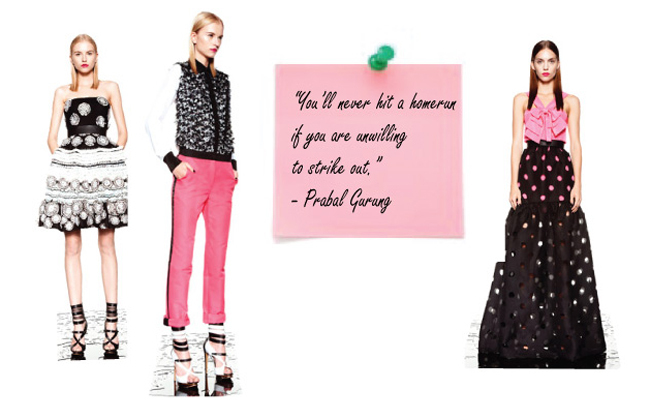 Love Prabal. can you check out my fashion blog? am new to this! The woman he describes, that the kind of style I am pursuing this summer. I love the quote you highlighted!